The Coastal Resources Management Program's mission is to protect and enhance fragile natural resources by reducing conflicts between competing land and water uses while representing a comprehensive approach to managing the impacts of development and other activities on coastal areas." Pennsylvania’s Coastal Resources Management Program is participating in the National Oceanic and Atmospheric Administration’s Coastal Zone Enhancement Grants Program. As part of that process, the program has developed a Section 309 Assessment and Strategy for the period October 1, 2016 – September 30, 2021. Click here to access the Section 309 Assessment and Strategy of Pennsylvania’s Coastal Resources Management Program, 2016 – 2021. 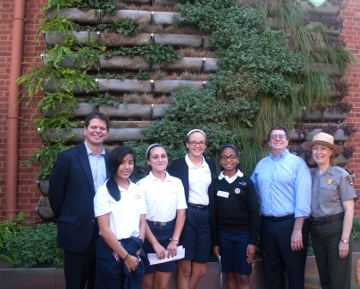 DEP Southeast Regional Director Cosmo Servidio (far left) joins Howard Neukrug, Commission of Philadelphia Water, Cynthia MacLeod, Superintendent of the Independence National Historic Park and students from St. Mary’s School in celebrating the completion of a solar powered “living wall” by the Philadelphia Water Department. The wall, incorporating native Pennsylvania plants helps manage stormwater at the Independence Park Institute. This Green Innovation project was partial funded by a grant from the PA Coastal Resources Management Program. 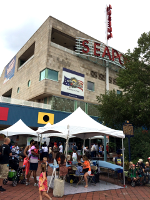 On September 12, 2015, the PA Coastal Resources Program joined with the coordinators of the event, the Partnership for the Delaware Estuary, and other sponsors in this annual public festival and education event celebrating the 112 miles of coastline within the Delaware Estuary portion of the Pennsylvania’s Coastal Zone. 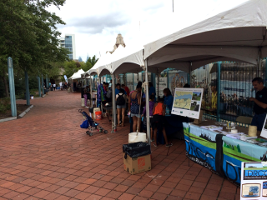 It was an opportunity that brought people to the Delaware River waterfront that helped increase awareness and promoted involvement in coastal resource protection. The DEP booth’s helped attendees learn about home water conservation. 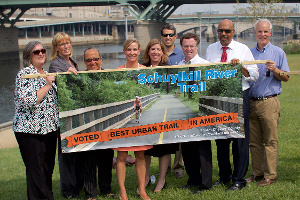 In celebration of the Schuylkill river Trail being named USA TODAY’s Best Urban Trail, Secretary Quigley joined DCNR Secretary Cindy Adams Dunn, and PennDOT Secretary Leslie Richards to a gathering of other local, state and federal dignitaries on Tuesday, September 2nd, in Philadelphia to provide testimonials to recognize those involved in its creation and to share the benefits the trail is making across a five county region and the work yet to be done. Over $545,000 in grants were provided by the Coastal Resource Management Program on various segments of the trail in Philadelphia. The solicitation period for FFY 2016 Coastal Zone grants is now open and will close on October 19, 2015. An updated application instruction guide and link to the online application can be accessed on the grants page. Periodically, the PA Coastal Resources Program will be uploading short videos of select projects highlighting local work in protecting, restoring and developing Pennsylvania’s two coastal communities and their resources. 2015 Great Lakes Children's Water Festival (links to YouTube) - The 2015 Great Lakes Children’s Water Festival, held at Penn State Erie, Behrend College on May 14, 2015, was one of the largest that the sponsor, the Water Systems Council, has ever hosted, drawing thousands of fifth-grade students from Pennsylvania, New York, and Ohio. These students explored drinking water, groundwater, watersheds, surface water, well systems, and water quality and conservation through dynamic and interactive activities. Support for the event came partially from the PA DEP Office of the Great Lakes and Coastal Resources Management Programs. Schuylkill Banks Boardwalk and Trail (links to YouTube) - The Schuylkill Banks Boardwalk is a portion of a larger multi-use greenway trail system along the Schuylkill River that provides public access and recreational opportunities in Philadelphia. 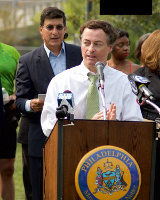 The trail was made possible through the support of the Federal Government, the City of Philadelphia and the Commonwealth of Pennsylvania, including the DEP Coastal Resources Management Program. Oblique aerial photography taken in April 2015 along the Lake Erie shoreline is now available for download. Click here to access the oblique page. The Water Systems Council (WSC) will hold its 2015 Great Lakes Children’s Water Festival on May 14, 2015 on the campus of Penn State Behrend in Erie, and is recruiting local volunteers to serve as presenters, classroom guides, classroom assistants, registration volunteers, Mess Hall workers, and logistics coordinators. The Children’s Water Festival promises to be one of the largest ever, drawing more than 1,700 students from Pennsylvania, New York and Ohio. These students will explore drinking water, groundwater, watersheds, surface water, well systems, and water quality and conservation through dynamic and interactive activities. More than 400 volunteers will be needed to staff the 2015 Great Lakes Children’s Water Festival on May 14, 2015. Volunteer, sponsorship and presenter forms can be completed on the WSC website at www.watersystemscouncil.org/water-festivals. Please register by April 15. The Pennsylvania Department of Environmental Protection is a Platinum Sponsor of the 2015 Great Lakes Children’s Water Festival. The festival will help DEP meet commitments for water conservation and efficiency outreach in the Great Lakes Compact Agreement.